In celebration of the one-year anniversary of its Contemporary Art + Design Wing, the Museum has announced significant acquisitions created by the Campana Brothers, Karen LaMonte, and Geoffrey Mann, to be installed in the coming months. These new works will serve to further diversify its growing contemporary collection, which currently includes more than 70 pieces from the Museum’s permanent collection by lauded contemporary artists and designers such as Fred Wilson, Liza Lou, Kiki Smith, and Danny Lane. 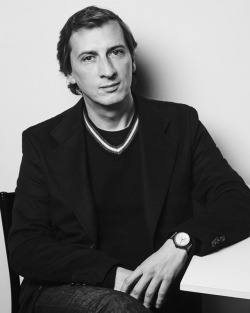 In 1983, Fernando and Humberto Campana founded the Estudio Campana in São Paulo, Brazil. Their creative practice aims to transform everyday materials into art objects. Inspired by Brazilian street life and carnival culture, the Campanas began their practice by making furniture from scrap and waste products such as cardboard, cloth and wood scraps, plastic tubes, stuffed toys, and aluminum wire, applying their handcrafted techniques and humble materials to new contexts through transformation and reinvention. 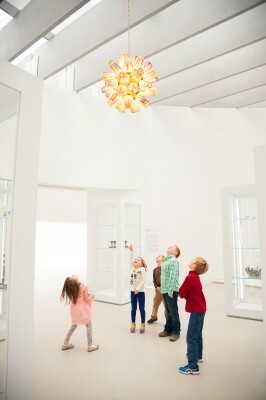 The Museum commissioned Sphere Chandelier from their Candy Collection and, last week, it was installed in the Contemporary Design Gallery. The chandelier is designed by the Campanas and manufactured by Lasvit, a Czech glass manufacturer specializing in high-end and custom design for furnishings, interiors, and architecture. 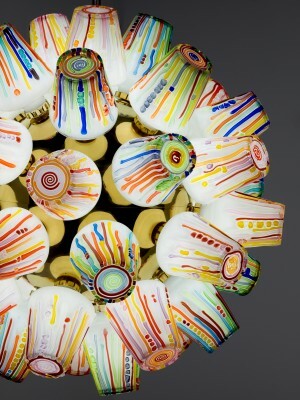 Made of colorless glass, the chandelier is mold-blown and cased with brightly colored hot-applied glass cane. Glass has fascinated the Campanas since childhood, and the Candy Collection was inspired by the colorful candies sold in popular markets in Brazil and the way that colored glass appeared to melt like candy, which they observed during their first visit to Lasvit. The work builds on the colorful themes of the brothers’ “Sushi” series. The Sphere Chandelier is the first Campana design to enter the Museum’s collection and is the Contemporary Art + Design Wing’s first example of contemporary Brazilian design. The Campana brothers have an ongoing relationship with the Museum and were guest artists at the Museum’s inaugural GlassLab during Design Miami in 2007. GlassLab is a mobile hot glass studio that provides designers with rare access to explore concepts in glass. 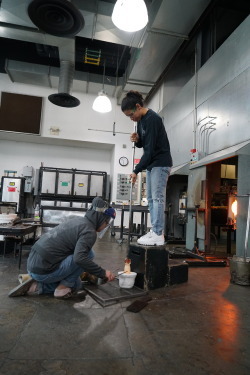 In both public design performances and private workshops, designers and glassmakers collaborate to rapidly prototype design concepts using the immediacy of hot glass as a catalyst for innovation. Ennion Society. Photo Martin Polak. Contemporary American glass artist Karen LaMonte explores the female form in her work to examine how clothing is a mediation between the self and the exterior world. The first American artist to work in the glass foundries in Železný Brod using monumental glass casting, LaMonte creates figurative art with the lost wax process, which is able to render great detail. Typically working in translucent colorless glass, LaMonte highlights the absent body beneath the clothing. 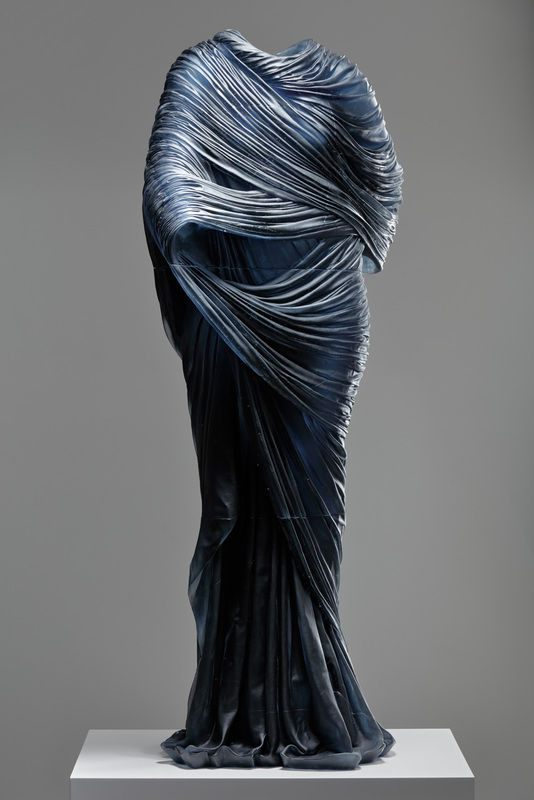 Nocturne 5 is darker in color and sentiment than her previous work, and depicts a life-size, standing female wrapped in drapery with an ombre tone that brings to mind the setting sun and draws inspiration from ancient Greek Tanagra terracotta figurines. Nocturne 5 was cast in three pieces that join at the waist and knees of the figure. The glass itself is a new formula developed by LaMonte to achieve her desired degree of color and density referencing dusk and the atmosphere of night. Nocturne 5 was conceived and realized using LaMonte’s unique fabrication process. LaMonte makes her artwork in several stages. She starts by taking a mold of a live model, which is used to make the impression of the underlying body. She completes the composition using drapery which defines the now absent figure. She uses the lost-wax casting process to create the final sculpture in glass. Rubber molds of the clothed absent body are used to make a wax positive, then a plaster-silica mold is formed around the wax. Once dry and stable, the wax is melted out of the mold. Cold glass is stacked above the mold and the kiln is fired to the melting point, before being slowly cooled. Annealing the pieces of Nocturne 5 required eight weeks. Once fully annealed, the mold is removed from the glass. Rough spots are ground down, and the entire sculpture is finished with grit blasting and acid polishing. Nocturne 5 will be the third work by LaMonte in the Museum’s collection. When considered together, demonstrate her progression as an artist and technician over the past 20 years. In particular, Nocturne 5 features semi-opaque, sharper lines than her previous work. In the future, the Museum plans to display Nocturne 5 alongside Evening Dress with Shawl (2004) to inspire discussion on conceptions of beauty and the female body, art and craft, and the power of light and shadow in glass. LaMonte has said she could imagine the works installed together, each informing the other and inseparable like day and night. Geoffrey Mann is a Scottish artist and designer whose work challenges the boundaries of art, craft, and design. He creates models for his objects using digital technologies, and then has his objects made by craftsmen using traditional techniques. His work is based on observations of time and motion, and he traces invisible natural phenomena to explore the effects of sound and light on objects. His tableware designs and sculptures are conceptually and physically unique, documenting passing moments and incidents. Among these groundbreaking designs is his Cross-fire series of works that is both aesthetically sophisticated and technically innovative. Made of borosilicate glass that is flameworked, Cross-fire is inspired by mapping the soundwaves of the 1999 film American Beauty. Using rapid prototyping, Mann created his models to illustrate the sound waves from the argument between the characters of Lester Burnham and his wife as they ricochet back and forth across the table, altering the ceramic dishes, glasses, and silver tableware, transforming the wine glass and decanter from simple, modern forms into highly irregular shapes. 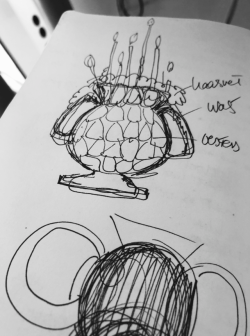 The Cross-fire wine glasses and water jug were designed in 2010 and fabricated in 2015. The decanter and stopper, inspired by the Cross-fire animation, were designed and fabricated in 2015. The objects are accompanied by 360-degree photography/animation, which the Museum will feature on its website. The glass objects were created with the assistance of John Liddell, a scientific glassblower, and the animations were made with the assistance of designer Chris LaBrooy. This is the first work of Mann’s to enter the Museum’s collection.